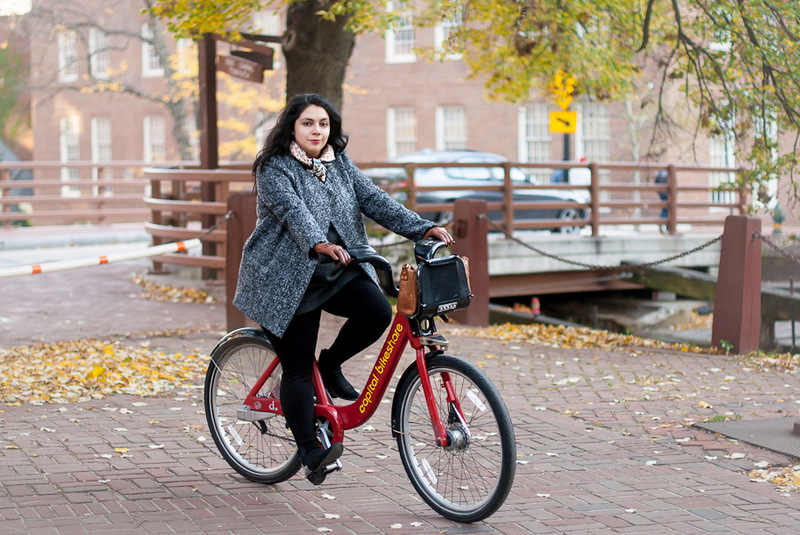 This past weekend marked my first full year of membership to Capital Bikeshare, DC’s bicycle sharing program, and I thought it would be fun to reflect a little on a year spent riding around on those distinctive red bikes. In the spring of 2013, I was starting to feel more comfortable biking around town and decided to try commuting into work via bicycle. 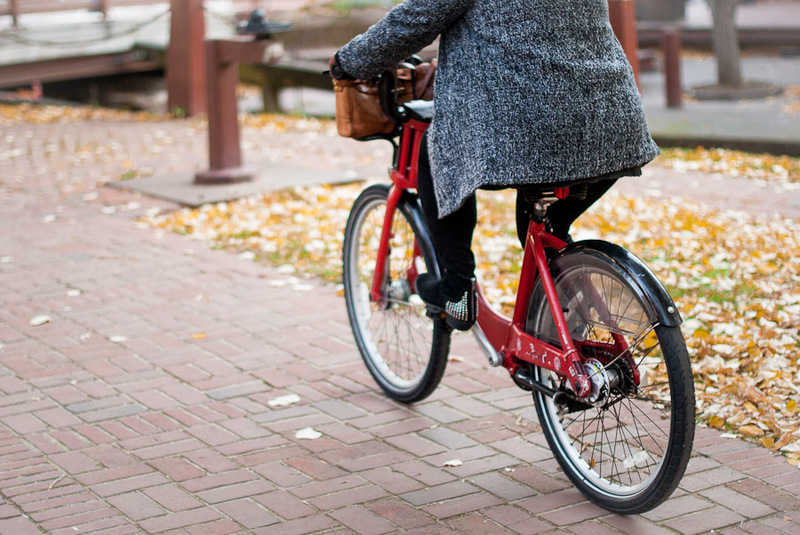 I have a gorgeous little Dutch-style bike from Public Bikes, and I loved the idea of building more exercise into my routine while cutting out some of the stresses of taking the metro or the bus (we don’t have a car). There aren’t great north/south bike lanes on my side of town, but I quickly figured out that I could travel on the bike path through Rock Creek Park, DC’s greenbelt, and avoid riding through traffic almost entirely. Summer and fall of last year as a bike commuter were so amazing! I was spending so much less money on transportation, riding through the park was gorgeous, and the one down-side of the ride, a steep hill alongside traffic just before I got home, was nerve-wracking but had left me with killer legs. Then, in late fall, Daylight Savings Time ended and I realized that I couldn’t safely bike home in the dark through poorly lit Rock Creek Park. Riding through the city felt too dangerous, especially in the after-work rush with scant bike lanes and poor visibility. I was pretty devastated at the thought of being stuck on public transportation all winter, and I kept wishing I could just ride in to work in the the mornings and magically transport my bike back to my apartment in the evening. And then it hit me: Capital Bikeshare! In the mornings, when there was daylight, I could pick up a bike at the kiosk on my block, drop it off right outside my office, and then take the bus or metro home in the evenings when it was dark. Overall, I had 137 rides using Bikeshare last year, mostly for commuting. That’s pretty good considering (1) I only ride one way, (2) I traveled for about nine weeks last year, and (3) we had a terrible winter that was often too snowy and icy for safe riding. My commute averages 24-27 minutes depending on my energy level and if the park is looking really photogenic that day. I like the one-way rides so much that it’s now my new routine all year. My leg muscles aren’t quite as killer, but I ride more often now that I don’t dread struggling up that crazy hill in traffic. 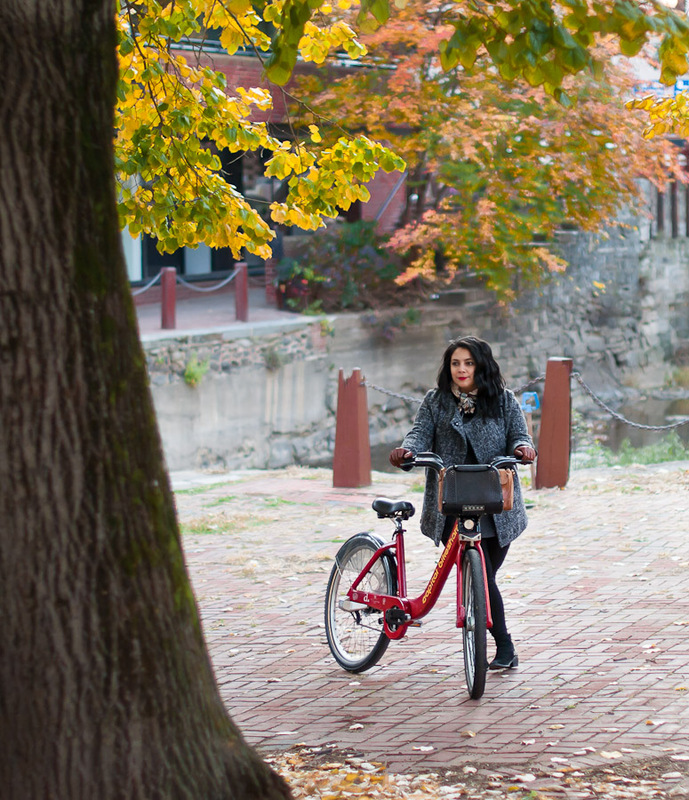 Bikeshare’s website makes it super easy to locate kiosks and check bike availability. I don’t use the app, but only because my phone is crap. My local kiosk is incredibly popular so sometimes bikes can be scarce. This is my biggest annoyance overall, but there is another one a few blocks away that usually has bikes. Rickety bikes that make weird noises are annoying though workable. You get better at identifying and avoiding them. The bike bells are broken about 25% of the time, but that isn’t a huge deal. I’ve had one mid-ride flat tire. Not bad for a whole year of riding, and super not bad considering that all I had to do about it was walk the bike to the next kiosk, hit the red button for repairs (and turn the seat around to warn other riders), and grab another bike. Bikeshare charges an extra fee if you go over the 30 minute limit. This only happened to me once and I was on a slow ride with a very pregnant friend, so we knew it was likely. The extra time was less than half an hour so the additional cost came out to $1.50. In DC it tends to rain in the afternoon, so it’s really great to ride to work when the weather is still nice, and grab a bus in late afternoon when it’s pouring/snowing/sleeting. No more choosing between leaving my bike at work overnight or riding through awful weather. I was also mulling over the finances of using Bikeshare as opposed to bus and metro commuting, and thought the cost breakdown was pretty interesting, too. A $75 membership fee spread out over 137 rides comes out to about $0.55 per ride. Bus fare is $1.75 per ride if you use a SmartTrip card. 137 rides on the bus would be $212 at regular fare. Metro fare is $2.15 minimum during peak hours (which is when I commute). 137 rides on the metro would come out to $294.55. So overall I have to say that I’ve loved using Bikeshare and I’m excited to see how many rides I can get in over the next year. It almost feels like a challenge to beat this year’s total! Georgetown photo shoot? I’m surprised I’ve never run into you before! DC can feel so small sometimes.